An innovative, viable solution that helps suppliers sell excess stock online, to develop new business relationships, showcase their products, and clear warehouses. Textile manufacturers around the world are often stuck with excess fabric they struggle to get rid of, because logistics, time and lack of visibility complicate things. From a designer point of view, current sourcing realities limit sourcing, inhibit creativity and innovation, thus affecting what they can produce for consumer needs around the globe. By developing a web platform that enables buyers to acquire left-over, in-stock textiles worldwide, TENGIVA solves two major industry problems. First, it allows buyers to acquire textile in smaller quantities that help support specific stages or needs within the creative process: sampling, sizing sets, small productions or even custom orders. Removing minimum orders gives them freedom to explore and innovate. Then, there are textile manufacturers that end up with excess fabric for many different reasons; second quality fabrics, mistakes during the dyeing process, customers with insolvency issues, development test runs, etc. This textile isn’t picked up by the original buyer, but it’s still very useful for others. They want to buy it. They just need to know it’s available and easy to access. This represents new business for manufacturers that want to expand their reach. “In order to support the demanding sourcing goals of an important uniform company, I had to buy over 4 million meters of performance fabric per year. However, before investing in large amounts of a certain textile, there’s a whole testing process you want to go through, in order to make smart choices. With textile, the current buying system forces you to buy substantial quantities and so, to respect budgets, you end up limiting your tests, you explore less and, ultimately innovation is constrained.” -Annie Cyr, founder of Tengiva. Tengiva connects buyers and sellers, helping manufacturers improve their bottom line and efficiently distribute textile, while giving buyers increased access to great products, without having to overspend. It’s textile industry matchmaking and circular economics for better resource distribution and use. Additionally, we educate buyers on textile types, advantages, features, limitations and much more. Sourcing becomes smarter. So, here’s how Tengiva works: selected, pre-screened manufacturers feature their inventory, on a micro-store that’s designed to showcase their excess stock. Each supplier has his own store, under the Tengiva umbrella. Direct contact information is published, so future production orders can be processed directly with a supplier. We understand production orders are a manufacturers core business and this isn’t our focus. Our mission is to give textile vendors the tools they need to feature their excess stock, sell it to relevant buyers, develop new business and clear warehouses. The platform was designed specifically with industry insider knowledge, so it’s easy to use and features relevant and necessary information that helps buyers make sound decisions. We’ve created simple dropdown menus, and a glossary that everyone can feel comfortable with. Buyers can browse by textile type, and also consult educational content that will further their knowledge of the available products and make buying smarter. The textile industry is enormous. Marketline reports astounding numbers for 2017 where textile and yarns combined, represented 746.1 billion dollars, with textile alone accounting for 83.1% of that amount. Statistics Canada confirms the size of this industry, with Canadians importing close to 3 billion dollars’ worth of textile in 2017, while exporting an impressive 1.4 billion. Quebec’s Ministry of Economy, Science and Innovation and the ACCORD initiative support TENGIVA through a financial aid program available for the province’s manufacturers that sign-up to be featured on the platform for 2019. 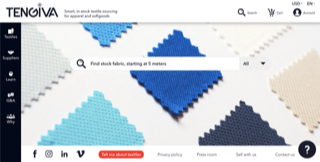 Though certain websites feature textile, no platform connects multiple manufacturers to buyers that could purchase their excess stock, thus serving the needs of both parties. By building an online marketplace that’s simple, intuitive, and tailored-made for the industry, Tengiva improves sourcing, and creates a win/win situation for both buyers and sellers. We’re currently adding textile suppliers to the platform. Fabric will be available for purchasing before we ring in the new year! TENGIVA is a powerful online marketplace that enables manufacturers to feature in-stock textile products, while helping buyers find relevant quantities of what they need for sampling, research & development, designing, product development, sizing and more. Created in 2018 by industrial fashion management major Annie Cyr, a reputed textile sourcing expert, author of the Textile Fibers Guide and founder of CACITH Inc., TENGIVA challenges the textile sourcing status quo, by recognizing consumer needs and technical trends, while developing educational tools and revolutionizing access to resources and information. TENGIVA favors easy, online exchange that empowers and supports sustainable industry growth. Based in Quebec, Canada, TENGIVA serves the industry worldwide.